Reflecting on the end of a successful tax season we have a lot to celebrate (and we did!). 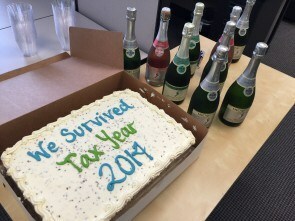 This was the first full tax season that SmartVault delivered integrated document management and a secure file sharing portal to Intuit® Lacerte® and ProSeries® customers, after launching the integration in the summer of 2014. Through our partnership with Intuit, we supported over 1,500 new accounting firms this season, using SmartVault to support hundreds of thousands of their clients. To our customers. Thank you for trusting SmartVault as your document management partner this year. We know that being able to easily retrieve, manage and securely share client information is at the core of your workflow – and we are committed to doing whatever we can to improve your experience with SmartVault. I assure you that we have big plans to make Tax Year 2015 even better. Our product team has an aggressive roadmap to deliver more features and usability enhancements to make SmartVault even better. Your feedback is the single biggest contributor to how we prioritize updates. So if you have a few minutes, please take this short survey and tell us what you want to see next. To our customer care team. I am incredibly proud of the care you’ve taken of our customers in their busiest, most important season. From extending our hours to better support customers when they need us, increasing the channels for support by adding Live Chat so customers can more easily engage with us to get answers, to the extraordinary effort by our training team to develop better content to improve the onboarding experience, our entire team has proven their commitment to our customers, and their overall success. From time to time, I get emails directly from customers, and this is one that the team really appreciated (thanks Darlene!). With all of the improvements we made up to this point, I know we can still do better – and we will. I’d love to hear your comments and suggestions on ways we can make SmartVault a stronger partner for your business as you look ahead to Tax Year 2015. Email me at rpharr@smartvault.com. We look forward to strengthening our partnership with you.